Here it is, the definitive post about using PPA for your paper quilled jewelry! I have a couple posts already about using sealants for paper quilling jewelry, and now I want to do a detailed post about each individual one. So I’m starting with PPA (Perfect Paper Adhesive). PPA comes in two styles – matte and glossy. They truly live up to their names. Matte is really truly matte and glossy is definitely glossy! I will show you examples of using both of them. Transparent, UV protective, acid free, archival & non-toxic, this universal acrylic adhesive and medium, has been extensively studio-tested on literally every type of paper, plastic, metal, wood & glass. Substantially different than any other wet adhesives, PPA is non-sticky when wet and absolutely non-tacky when dry. Use PPA for: fine art collage, montage, assemblage, decoupage, rubberstamping, scrapbooking, book arts, a dry pigment medium, glazing, or as a top coat. Finish Coat – achieves a glossy or matte water resistant smooth finish. Adhesive – is the finest paper, glass, leather, and collage adhesive available. Medium– mixes readily with acrylic or latex paint, and dry pigments to form a water-resistant acrylic paint. You can purchase PPA at well stocked craft stores around the world, as well as here on Amazon . As you can see, it is great for sooo many crafts! I am glad that I tried it out for paper quilling because it turned out to be my favorite glue (read more about glues for paper quilling here)! But it turns out it’s more than a glue, its’ an amazing sealant as well. I’m going to cover several topics in this post including how to apply it in a thick layer, in a thin layer, and how each of these look in both matte and glossy. I will also give as many tips and tricks as I can about it. Let me know if you have any questions and I’ll be happy to add the answers to the post, or make a new post about them if there are enough topics to cover! You can choose to apply PPA in a thick or thin layer. For a thick layer, you just squeeze the PPA directly onto the surface of your finished piece. 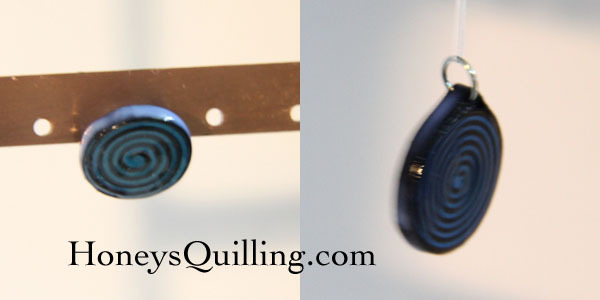 This technique works best for pieces that are solid such as these spiral circles, or for pieces that are glued into an inset pendant. You may notice some tiny bubbles in the PPA after you squeeze it on (if you are very careful you can avoid them during application). If they are super tiny you can just leave them, but if they are big enough to pop, use a needle quilling tool to poke it or to drag it to the edge so it pops. Wait until one side is completely dry before flipping it to the other side and applying PPA to it. Now it’s time to apply PPA to the edges. If you apply it while it is laying down on a surface, the glue can cause a shiny flat part around the edge of the piece. This can ruin the look of the one side, so to avoid it, I hang the pieces when I apply the PPA to the edge and allow it to dry while hanging. Pardon the bad quality of the photos below, but you can see how I hang the pieces on my jewelry stand. I then apply the PPA and allow it to dry completely. To apply the PPA in a thin layer, squeeze out some PPA onto a surface and use a small paintbrush to paint the PPA onto your piece. Make sure to squeeze out small amounts at a time and use it right away. If the PPA sits out and dries a bit before applying, you can get lines in the PPA as you can see in the pink swirled pendant below. I painted the earrings first so there are no lines in the surface of those. When you apply PPA in a thin layer, it will not take as long to dry. You also do not have to hang the pieces to apply it t the edges as the PPA is a thin layer so it won’t drip down to one side causing any flat edges. PPA comes in both glossy and matte. They each deserve their own descriptions and tips, so I’ll separate them into two subjects here and share photos of each with both a thin layer and thick layer. I’ll start with the glossy! Glossy PPA has a beautiful glossy finish! You can use it as a thick layer or thin layer on your paper quilled jewelry as a sealant. You can use it alone or on top of another sealant (I will show and explain the difference). Here are some photos of two sets of spiral circle jewelry that I made. The blue/black set has a thick layer of PPA. The pink set has a thin layer that I brushed on with a paintbrush. When you use a thick layer it really coats the piece, making it look more plastic-like and very shiny. This is a fun effect. The only downside I see is that it is easy to get fingerprints on it, but not a big deal, just wipe with a cloth. It’s the same with any shiny plastic jewelry. When you use a thin layer you can still see and feel any ridges in the paper, so it doesn’t look as plastic-y, but it is still shiny. Be aware, as noted in the earlier paragraph, that if you apply a thin layer it is best to do it quickly when the glue is out of the bottle and not let the glue sit on a surface for some time before applying it. You can see in my pendant that you can see the brush marks in the surface of the pink pendant. You cannot see the same on the earrings since I applied the PPA to those first. It is not very noticeable unless you look at it at the right angle. That’s why you can see the brush lines in the first photo, but not the next couple, as I photographed at the right angle so you could see the brush marks. PPA is naturally flexible when it dries. It does not stiffen and will never crack. So if PPA is the only sealant you use for your jewelry, it will remain flexible. In the black and ivory spiral below I only applied PPA. It is completely dried and I can push it into a slight cone shape because it is flexible. When I let go it goes back into a disc shape. If you are making a solid piece of jewelry like this, it is okay if it is flexible. If you are making a very delicate piece, you may want to use an additional sealant. I always use matte liquid sealant first so that the piece becomes stiff/hard and then when it is dry I apply the PPA on top. It is just my preference. Either way will be just as water resistant as long as you coat your piece fully with the PPA. The bottom right photo here shows the black and ivory spirals. The one on the left has a thin layer of PPA. The one on the right has a thick layer. Notice the muting of the colors in the one with the thick layer. This happens with some colors. This only happens with some color blends, I think it’s just the way the light shines through and makes the black and ivory kind of blur together. Not physically, but just the lighting. Just something to take note of if you are making a piece with dark and very light colors together. Notice that with a thin layer you don’t get the muting effect and it is bright, nice, and shiny! Now let’s take a look at matte PPA! This gives a very matte look, there is no shine at all to matte PPA. A great choice when you want to make sure that your paper quilled jewelry still looks like paper! These photos show the difference between a thick and thin layer. Again, for the thick layer I squeezed it on, popping any bubbles with a needle tool. For the thin layer I used a small paintbrush and brushed it on. The thin layer dries a lot more quickly, it even started drying before I could get the photo taken as you can see! The difference between the finished pieces is that you can still see any paper ridges with the thin layer. The thick layer disguises the ridges so you can’t really see/feel them. Of course ridges only happen if the papers you are using aren’t *exactly* the same width, which can happen when you use different colors/different brands together. I personally don’t mind the ridges in most designs, it makes this one look more like wood I think. There doesn’t seem to be as much of a difference between thick and thin for matte as there is for glossy. For glossy it seems there are times it’d be nice to have a thick layer. But for matte, I don’t really see that it would be of benefit. But that’s just me, you can certainly give it a try yourself and see if you prefer it that way! As mentioned with the glossy PPA, it dries flexible and clear. If you don’t use any other sealant underneath, your final piece will be flexible. The second photo here shows a piece that only has the matte PPA as a sealant. I can push the middle with my finger to make it stick out. But if I release my finger the shape will go back into a disc as it was when I applied the PPA. This will still work fine for jewelry for these solid pieces. But note that if you are using a delicate design, you may want to first put on a base coat that will stiffen your piece. The left photo below shows two discs made with the same color papers (grey and speck-tacular rose). The one on the left only has matte PPA as a sealant. The one on the right uses liquid matte sealant first and then matte PPA on top. Notice the color difference. This is because liquid matte sealant can darken your paper (not all papers, the ivory/black discs above don’t show this difference). Really this photo is more useful in my future post about liquid matte sealant, but I wanted to show it here as well so you can think about what you use as a base sealant if you choose to go that route. I choose to use liquid matte sealant as I like the way it stiffens the paper, even though it does make it a slight shade darker. You can read more about liquid matte sealant here and here. **added note** another liquid sealer that I found that works to stiffen paper as well as the liquid matte sealant I used to use is this Ceramcoat Liquid Sealer . I’m not sure yet if it darkens the paper or not, I’ll be doing a full post on it soon! 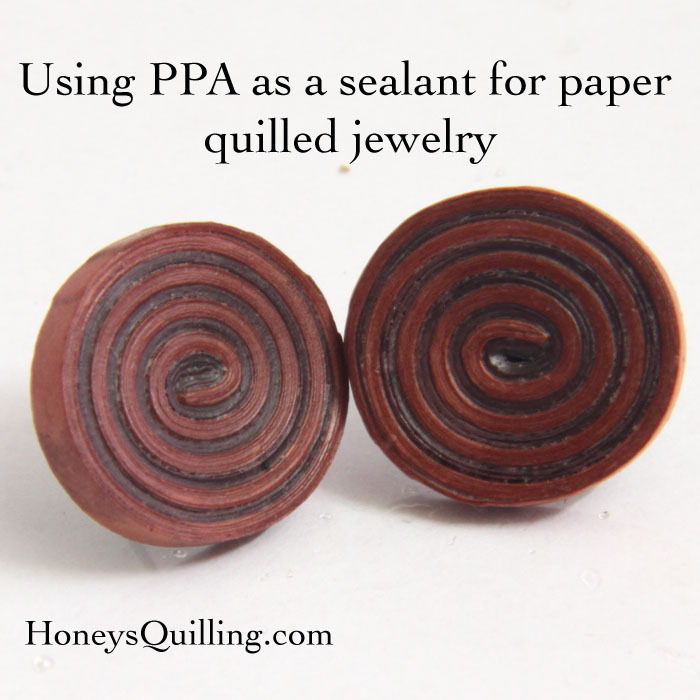 PPA makes a wonderful sealant for your paper quilled jewelry. Whether you want a matte look, or a shiny finish, it has you covered! It is flexible, clear, non toxic, archival (it won’t yellow! ), and non sticky. I have been using it for more than 2 years and I have been very happy with it! Let me know if you have any questions and I’ll try to answer them, I may even add the answers to this post! Have you used PPA? Do you like it? Stick around to visit some more great posts on the blog! *This is NOT a sponsored post. I purchased the PPA matte and gloss myself and am sharing my honest experience in hopes that others find it useful. *This post contains some affiliate links. If you make a purchase through the affiliate link I get a small percentage (at no cost to you!). Thank you for supporting my blog! PreviousClearance on Paper Quilling Supplies! 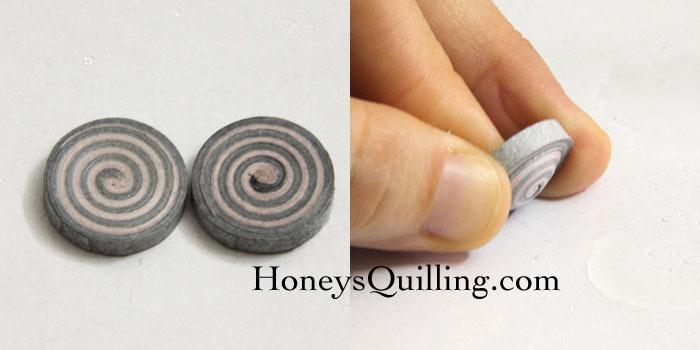 Start Paper Quilling – The Fun Stuff! I would like to order the PPE adhesive (both gloss and matte). Can u please tell me how much is the cost? Does the work surface need to be protected? If so, with what? I use a plastic sheet on my workboard. Any plastic surface will work as a protection. Another question: When adding jewels or crystals to paper quilled jewelry, should they be in place before using PPA as a sealant or after? Either way would work, but I think the crystal/jewel would stand out more if it was added afterwards. Thanks for the information, plastic and afterwards it is. Also, thanks for the prompt reply. Will it be a even coat if i apply these sealent after making Jumka(cone shape earing). will this leave an odour after drying. how to apply on these Jumka models using this PPA. If you are applying PPA to a jhumka use a paintbrush and do a thin layer. If you do a thick layer it may slowly run down the sides while drying and leave a thick layer at the bottom edge or even drips. So as long as you do a thin layer with a brush, it will be an even coat 🙂 It will NOT leave any odour after drying, one of the things I Love about PPA! I’m beginner in quilling jewellery making, I’m getting big hole in the centre when I make a disc is there any problem with my quilling needle. Pls reply I’m learning quilling in net. Hi 🙂 What tool are you using? The bigger the end of your tool, the bigger the hole in the center of your disc. Also if you are winding it very loosely, then it will have a bigger hole as it will expand. You need to wind it firmly enough. can i use this to seal in images printed by a printer at home? I don’t actually know. But you can email the creators of this product from http://USArtQuest.com and ask them! Hi dear,i am really felt frustrated to seal my jhumkas and make it shinning ?i bought varnish from india.its for me not work out ! Hi, sorry to hear that your varnish is not working for you. What brand are you using? I’d of course suggest to use one of the brands that I have mentioned here, or another well known brand. It can be expensive to buy the good ones, but at least you know they will work! Also, a small bottle of sealant can be used for many many jhumkas or other designs. I had ordered PPA gloss finish for myself and a friend of mine. I did not use it yet on my products (which are few dolls and flowers), but my friend who used it on the quilled earrings did not get a very glossy finish. How do we apply the PPA to get a perfect gloss finish? Should we not use a brush to apply but use it directly? And how many coats are required if we can apply using a brush? Can you help us out..? Yeah, that’d be the next thing to try 🙂 even with a thin layer it will be glossy, but only if you look at it at the correct angle against the light. Hi how to apply acrylic paint and ppa both on jhummkas.should I mix both and apply it or one by one. And which acrylic paint is best for paper quilling? Ur creations r awesome. …I want to ask you that can I use PPA as a sealant as well as glue? ?? Is it waterproof? ?? Thank you 🙂 yes, PPA is a great sealant/topcoat for your quilled work. It is very water resistant. All topcoats you see like mod podge, crystal coat glaze, diamond glaze, etc. Are also water resistant. They are not 100% waterproof. For that you need to use something like resin. But water resistant is good enough for quilled jewelry. It will survive falling in a puddle if you pick it up quickly, but it may not survive a trip into the washing machine. Actually I haven’t yet used the comb to make earrings, I am planning on trying that soon! Hi, my inglish is not so good but i like reading your posts! Thanks!! I want to ask about delicate design. You suggest to use matte liquid first. Spray liquid? And after that, shoud i use brush for the ppa? And how much should i pay attention to any corner?? And last one- if i glue the quilling desiges to frame/bristol board etc. Shoud i do something different? This is wonderful blog that I have ever come across. And also you are answering questions very quickly. I have few queries with using PPA. Here they goes. 1) As I am making Jumkas, and I need them to be stiff, how to apply PPA.? But as per the above information provided, “I always use matte liquid sealant first so that the piece becomes stiff/hard and then when it is dry I apply the PPA on top.”, why to apply PPA after applying matte liquid sealant, if I am doing matte Jumkas..? If I need glossy finish for my Jumkas and need hard type, then how to apply ? 2) As you said liquid matte finish, which brand is best to use ? 3) As I am a beginner, I have used some local available varnish for my Jumkas and after few days they turned to white color.. which I am totally disappointed with.. Hence need your advise to make wonderful jewelry without color change..
4) If I want to fix some pearls or stones over Jumkas, what would be the best procedure that I need to follow. ? I mean to ask, what to apply and when to apply. 5) Finger prints is one more issue. As you said to wipe out with cloth, still the same issue. From long view its ok.. But closeup they are still visible. 6)I want to make Jewelry with border buddy. There is a problem after making the same. For example, After making the square with border buddy, and applying varnish or so .. it is becoming stiff as per my requirement. But after few hours, varnish is getting cracked up and falling off like powder and they are becoming soft like normal paper. I want to know how to make these and how to apply sealant. These should be hard matte look. Kindly advise. After all, I would request you to upload few videos for my questions. And that would be fantastic for everyone who wants to learn. 1) The liquid sealant is good at making the paper quilling very stiff, but it is not as water resistant as PPA and other topcoats or glazes, so that is why it is best to use another layer on top of it. I use the liquid sealant and then when it is dry I apply either gloss or matte PPA depending on whether I want a glossy or matte finish. 3) I would suggest not to use those inexpensive sealants that turn whitish. If you purchase brand name products that are well known, you will have good results! PPA, Crystal Coat Glaze, Diamond Glaze, etc. are so much better! 4) There are many ways to apply the pearls and stones. One way is to use your glaze also as the glue. So apply your topcoat and then stick on your stones. You can also wait for your glaze to dry, and then apply the stones with the same glaze as the glue. All of these glazes also work as glue. If you want you can apply a layer of glaze overtop of the stones for a different look. 5) Make sure not to touch your pieces until they are fully dry. You will only get to see the fingerprints if you press fairly hard when it is not completely dry yet. If you want to make sure not to get the fingerprints at all, use a harder glaze. Diamond Glaze is the hardest that I have used, with PPA being next best. 6) If your varnish is cracking and falling off, then it is no good for that purpose. If you use the products I recommended you will not have that happen. Usually I dip border buddy pieces into the liquid sealer, let it dry completely and then paint on the topcoat/glaze of choice. i need help .pls suggest me which glue is best to pest posts on paper quilled ear rings..and which varnish may i use to waterproof the jwellery?